In this first special issue we address the inclusion of pigeons in the World of Cosmetics. The cosmetics industry extracts many of its raw materials from plants and animals. One original idea comes from Japan: they produce a facial treatment made from nightingale droppings. This is a very exclusive product that is highly popular among the wealthy classes -for instance, it's been hailed that Victoria Beckham uses it. Our team discovered a local Spanish enterprise that has plans of emulating it at low cost. The key idea is to use pigeon droppings as the raw material for a luxury face cream. Our team organized a visit to this factory, in Lugo, North-West of Spain. This is the interview that we held. We arrived at the farm, Mrs. Antelo was waiting for us. Is this a farm or a cosmetic factory? I asked, looking at the chickens. Well, we are just starting, she said smiling.... I like to say that this is a family business. 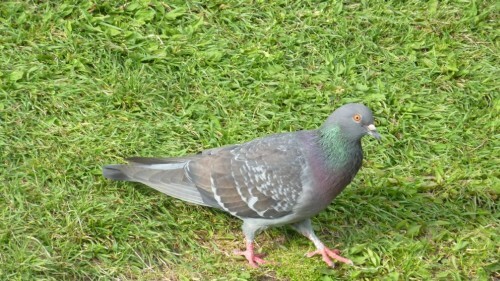 An artistic picture of a wild pigeon in the farm gardens. Later we discovered that it was trying to get into the facility. This is a bio-sustainable enterprise. It is in countryside and it doesn't pollute. Green and feathered, is our slogan. The facility consists of a big glass house which contains the pigeon habitat and a small attached building where the cosmetics are produced. Mrs. Antelo explained the idea to us: here, the pigeons live in the glass house. Is is a 130 sq. meter habitat. and includes everything they need.... water supply, grass, some little trees and the shelves where they nest. Of course, we feed them with a special food.... this is the key element of our product. It is a mixture of seeds, seaweed and oligoelements. They are confined inside the habitat, so we keep complete control of everything they eat. By the way, here comes Raffaela. 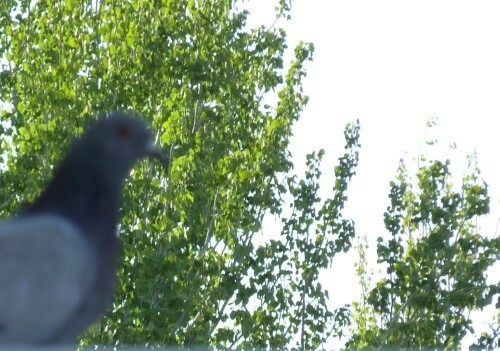 A pigeon approaches and curiously looks at us. It is funny, I think, that they use human names for the pigeons. All the pigeons are born in the habitat. They are kept for 2 years and then released. We do this because we need young animals and it is actually a shame, because they are happier inside than outside. At the beginning they try to come in, but after a while they realise that it is impossible and give up. They start a new life in nearby towns. 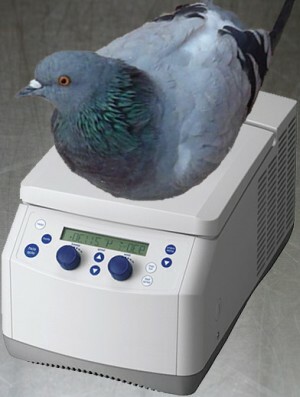 Every pigeon passes a weekly test. 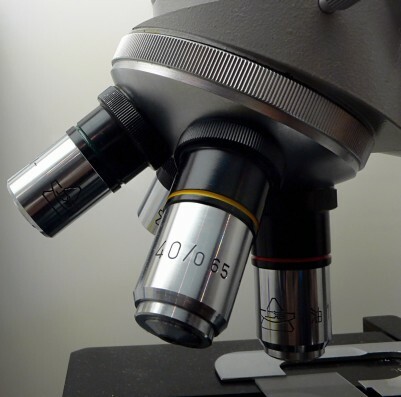 We analyse the weight, health and presence of parasites. In this picture we can see Alexandra's weekly check-up. So, what is the idea of all this? I asked. For first time in the interview Mrs. Antelo's expresion is serious. Well, we collect the pigeon droppings. Actually, we don't collect all of it, only the ones deposited close to their nests, for ease of collection. We have plastic containers around the nests. This raw material is very rich in nitrates, phosphorus and potassium. In addition, it contains chemicals related to their special diet that are key elements for the final cosmetic product. Then, in the lab, the pigeon poop is sterilized, processed, the Ph is corrected and some extra ingredients are added in order to produce the final cosmetic. But it is pigeon poo! I exclaimed. Mrs. Antelo smiles again. Yes, in the end it is, but it works!! Now, we are going to apply for the approval of the Health Ministry. We currently have two products, the soft and hard peeling. We are currently testing them on ourselves and on volunteers from the nearby villages. The soft peeling is similar to the Japanese product, but the hard one.... trust me, it is awesome. For two days your face burns and you need painkillers and heavy moisturising creams, but after that, the skin on your face as soft as a baby's bum. Why don't you use pretty doves instead of pigeons? I asked naively. Mrs. Antelo laughs very loud "different colour, same poo". Pd.- Please, don't try to use pigeon droppings on your face at home. It is a very abrasive substance. This post is quite different from other..Good to know that the key idea is to use pigeon droppings as the raw material for a luxury face cream...Nice one..